The series will host events and activities at a variety of cultural institutions to lower barriers for residents, to show them that these places are made for them, as they are made for everyone. 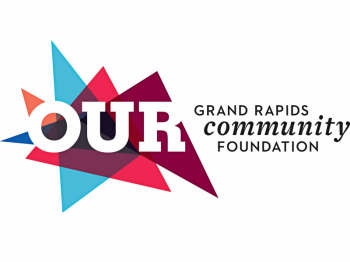 Email Mariah Cowsert at [email protected] or Jenn Schaub at [email protected] for more information on the community arts series or if you are a staff person at a cultural organization who is interested in partnering for resident engagement activities. “Our focus for the Community Arts Series is lowering barriers to resident participation so that our residents know that cultural programs are for them, and how they can best utilize the cultural organizations in the downtown area. The arts are for everyone, but they can often be intimidating, so we are excited to develop strong partnerships with organizations that are committed to community engagement in Heartside,” says Mariah Cowsert, Communications Coordinator at Dwelling Place. 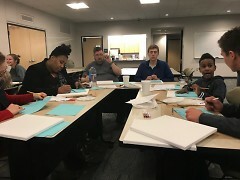 The Neighborhood Revitalization team at Dwelling Place and Learning Lab interns are developing, along with community partners, the Community Arts Series. Katherine Williams, Community Programs Coordinator at the UICA, came to the Herkimer Apartments to do an arts based activity with residents in March, as a prelude to residents visiting the UICA. Residents and staff made collages that looked to the Pantone Color of the Year exhibition for inspiration, using textures and patterns in purple hues. Williams shares, “The Urban Institute for Contemporary Arts (UICA) is proud to be part of the Heartside community. UICA has presented gallery exhibitions of contemporary artwork from regional, national, and international artists for over 40 years and hosts a range of art and film-focused events throughout the year.” The UICA is Dwelling Place's first confirmed community partner in the Community Arts Series. Daniel Drent, Dwelling Place resident, says, “I’m passionate about the arts in general, because I think it’s the ability to explore yourself and your mind, but definitely a strong interest in theater just because it can take you to a whole other world for those couple of hours." Drent is a member of the Resident Engagement Committee, a committee of the board that focuses on resident engagement through community arts, leadership, peer-to-peer support, and community gardening and beautification. The Community Arts Series will begin this week with a behind the scenes resident tour of the Pantone Color of the Year exhibition. Residents will be able to visit the UICA for free and participate in a docent-led tour of the exhibition, visiting multiple levels of the UICA and learning about low cost and free upcoming events. The Community Arts Series will directly connect residents to low cost or free cultural experiences, providing behind the scenes access, and empowering residents to stay connected to the culture of their communities. Programing will be provided across four target Dwelling Place apartment communities in 2018/19: Verne Barry Place, the Herkimer Apartments, Weston Apartments, and Ferguson Apartments. From making artworks to exploring theater performances, Community Art has something for everyone. Monthly events will be hosted in Dwelling Place apartment communities or at participating cultural attractions. The goal in hosting events and activities at a variety of cultural institutions is to lower barriers for residents, to show them that these places are made for them, as they are made for everyone. When residents are included in the happenings of their communities, they’re more likely to participate in activities, feel valued, and stay in their communities which in turn helps them grow. Cowsert shares that she’s “excited about being a part of developing the series and serving on the resident engagement committee as the staff person for the community art engagement. We’re already planning our 2019 activity lineup." 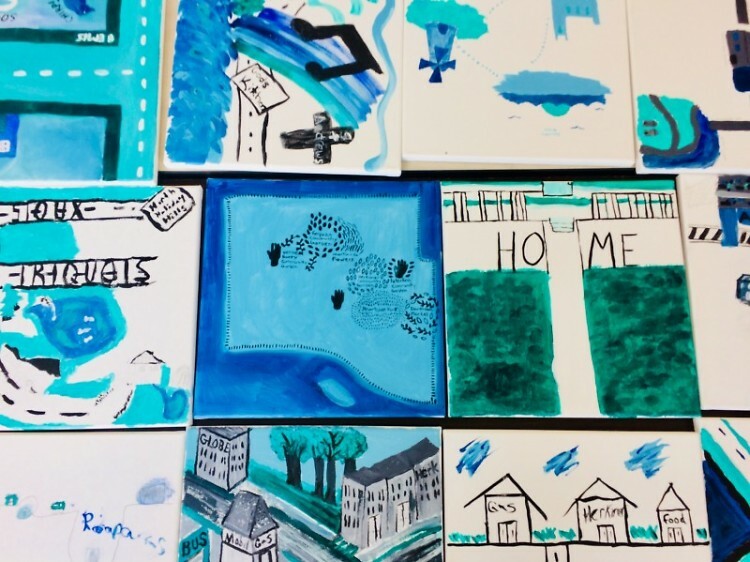 For First Fridays in May, residents' artwork will be on display alongside students from a drawing class at Hope College. 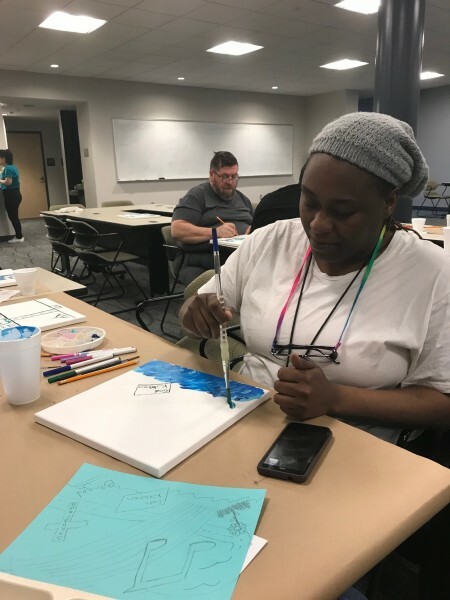 Together they were able to paint 34 neighborhoods that include landmarks of the places that they would show someone as they navigated our community as part of our paint your neighborhood nights at the Herkimer Apartments in Heartside. All participating artists will have their works on display in a community art show as part of Avenue for the Arts events on the First Friday of each month that showcase local makers and small businesses in Heartside. The reception for the show will be at 307 South Division Avenue in Grand Rapids from 5 p.m.-8 p.m., this event is free and open to public. Those who attend the artist reception have the option to paint their neighborhood and take the piece home. For First Fridays in June, there will be another exhibition by Dwelling Place resident artists focused on the theme of home. The exhibition will be Friday, June 1, 2018 from 6 p.m.-9 p.m. at 106 South Division as part of the free art events taking place on the First Friday of every month art along the Avenue for the Arts.